"Book 3 in this fantastic series. So easy to read and short chapters. In my opinion this is the best in this series so far. Follow Angel Murphy in her quest to find the baddies in this book in Corfu. Gerry McCullough lives just outside Bangor, Northern Ireland. She is married to singer-songwriter, writer, radio presenter and publisher Raymond McCullough, and has four children. She won the Cuirt Award for her short story Primroses in 2005, has won, been short listed and commended in many other literary competitions, and has had nearly 80 short stories published in magazines, broadcast, or published in anthologies. In addition to her prose work, Gerry is a poet with around forty poems published in literary magazines and anthologies, such as Speech Therapy, Four x Four, A New Belfast Poetry Map, Faith for Life, Writers’ Forum, etc. In 2015 her poem, Kelly Dancing, was shortlisted in the Harmony poetry competition, judged by Frank Ormsby, and was published in the booklet which was issued afterwards. In September 2016 Gerry’s poem Summer Passing won the Bangor Poetry Award, and in October 2016 her poem Stones at Carlingford was shortlisted and commended in The Glebe House poetry competition and included in their brochure. Gerry's first novel, Belfast Girls, published by Precious Oil Publications, was a #1 bestseller on paid UK Kindle. It was followed by Danger Danger, and then by Angel in Flight, the first of a series featuring Angel Murphy, a strong-minded Belfast Girl. Her second Angel Murphy thriller, published in 2013, is Angel in Belfast. Johnny McClintock’s War was published in August 2014. In June 2015 came Hel’s Heroes, a light hearted romantic comedy. Dreams, Visions, Nightmares was released on 1 January 2016. This is a collection of eight of Gerry’s prize winning literary short stories, extended and edited. In March 2016 came a very different book, Not the End of the World, a comic fantasy owing a lot to both C S Lewis and Terry Pratchett, followed by a third collection of light Irish short stories in the Tales of Old Seamus series, The Seanachie 3: Seamus and the Shell and other stories. 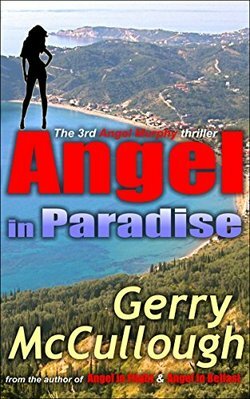 Gerry has now finished her third Angel Murphy book, Angel in Paradise, which was published on 4 January 2017 and went straight into the Amazon bestsellers list for its genre and into the Hot New Releases list. Angel in Paradise has already been described as the best of a fantastic series. These books can all be purchased on Amazon both in paperback and in the Kindle edition.